Heat oven to 375°F. Line large baking sheet with cooking parchment paper. Unroll dough into 2 long rectangles. Place on baking sheet. Overlap long sides to form 14x9-inch rectangle. Firmly press edges and perforations to seal. 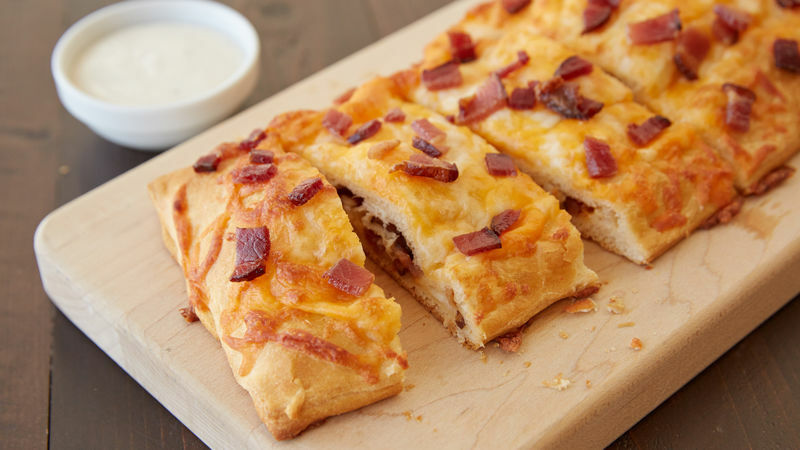 Sprinkle bottom half of dough with 1/2 cup of the cheese, 1/2 cup of the bacon and the chicken. Fold dough in half lengthwise to enclose filling, pressing to seal bottom and sides. Poke all over with fork. Sprinkle with remaining 1 cup cheese. Bake 19 to 21 minutes or until deep golden brown on edges. Cool 5 minutes. Sprinkle with remaining 1/4 cup bacon. Serve with ranch dressing. Don’t have pizza cheese blend on hand? Mix equal parts shredded mozzarella and Cheddar cheeses instead. Not a fan of ranch? Sriracha and barbecue sauce make fun drizzling options as well.